Wadi Al-Natrun, a narrow, 35 KM long depression below sea level west of the Delta, derives its name WADI (valley) Al-NATRUN (natron) from the vast quantities of sodium hydroxide obtained from a chain of small lakes used for mummification purposes in ancient times and, in the Roman Period, for glass manufacture. In its hey-day in the fourth and fifth centuries, under the pressure of Roman persecution, many Christians fled to the area to hide, and many hermitages sprung up. Holy men inhabited caves and formed monasteries. Lakes fed from the water table of the Nile dot the landscape. Today nine lakes are scattered along its general axis. Typha swamps occur at localities along the shores of the lakes. Juncus and Cyperus dominate the wet salt marshes on the water logged east shores. chemical symbol for sodium, Na, is an abbreviation of that element's Latin name natrium, which was derived from natron. In Coptic, the region was known as 'Shee-Hyt', meaning 'the balance of the hearts' or 'the measure of the hearts'. In Greek, it is known as Scetes, which means 'the ascetics'. In Christian literature, the region is also referred to as the Nitrian Desert . In ancient times, natron was mined here for use in Egyptian burial rites. It is believed that the Holy family visited Wadi El Natrun during their flight into Egypt. 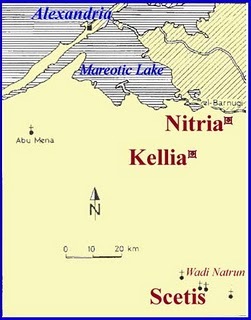 The alkali lakes of the Natron Valley provided the Ancient Egyptians with the sodium bicarbonate used in mummification. The region of Wadi El Natrun was and remains one of the most sacred regions in Christianity. Between the 4th century, when Saint Macarius of Egypt retired to the desert, and the 7th century A.D., the region attracted hundreds of thousands of people from the world over to join the hundreds of monasteries of the Nitrian Desert. The desolate region became a sanctuary for the desert fathers and for cenobitic monastic communities. 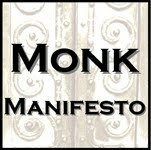 Many anchorites, hermits and monks lived in the desert and the hills around the region. The solitude of the Nitrian Desert attracted these people because they saw in the privations of the desert a means of learning stoic self-discipline (asceticism). Thus, these individuals believed that desert life would teach them to eschew the things of this world and allow them to follow God's call in a more deliberate and individual way. Some of the most renowned saints of the region include the various Desert Fathers, as well as Saint Amun, Saint Arsenius, Saint John the Dwarf, Saint Macarius of Egypt, Saint Macarius of Alexandria, Saint Moses the Black, Saint Pishoy, Sts. Maximos and Domatios, Saint Poimen The Great and Saint Samuel the Confessor. The Wadi Natrun...has been the site of continuous monastic life for over 1600 years. Its ancient name, Scetis, comes from the Coptic shi het, "to weight the heart," a most appropriate name for a place long dedicated to silence, prayer, and contemplation. The Wadi itself has a well-watered strip of oases about 20-25 miles long that runs in a northwesterly direction. It's southeast end is about 40 miles northwest of Cairo; thus it is neighbor to one of the largest cities in the world....The Wadi is not as remote now...you can travel there by car from Cairo in one and a half to two hours, and freeway signs in Arabic and English point the way to the monasteries. Modern irrigation has made the desert green alongside the road.... Green fields, speeding cars and trucks, and billboards, those ubiquitous signs of the modern, all conspire to take away remoteness. And yet the Wadi Natrun is nearly as far off the beaten path today as it was in antiquity, though for different reasons. The author of the Historia Monachorum reports that in 394 his group of spiritual tourists traveled down the Nile but did not go to Scetis because the desert route was too dangerous. Modern tourists skip the Wadi Natrun not because of danger but because they are more interested in King Tut than Coptic Monasteries. * As in the fourth century, however, there are still pilgrims: on Friday through Sundays, especially before Lent, busloads of Copts--men, women, and numerous children--come to visit the monasteries, considered one of the holiest sites of the Coptic Church. These latter-day pilgrims, thousands of them, connect the present to the past to the present; their presence and devotion provide convincing and powerful testimony to the continuing vital heritage of monasticism in Egypt.